The long-awaited cookbook from The Slanted Door,aJames Beard award-winning chef Charles Phan's belovedaSan Francisco Vietnamese restaurant. 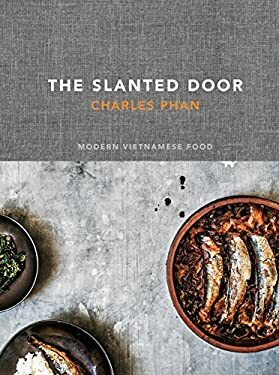 Charles Phan opened The Slanted Door in San Francisco's MissionaDistrict in 1995, inspired by the food of his native Vietnam. Sinceathen, The Slanted Door has moved across town to the historic FerryaBuilding and has grown into a world-class dining destination. Itsaaccessible, modern take on classic Vietnamese dishes is adored byadiners, chefs, and critics alike. The Slanted Door is a love letter toathe restaurant, its people, and its food, featuring stories and essaysaalong with to its most iconic recipes such as Seared Scallops withaVietnamese Beurre Blanc, Wok-Seared Eggplant with Satay Sauce,aand Rack of Lamb with Tamarind Sauce. In addition to recipes, theabook will include an extensive cocktail section, and essays on itsaesteemed wine program.